Iku said it’s not difficult to read the whole Bible. The secret is to read a little every day. Japan’s literacy rate is almost 100 percent. It was customary in ancient Japan for women to blacken their teeth with dye as white teeth were considered ugly. This practice persisted until the late 1800s. There are three Adventist nursery schools in Japan, all bearing in their name the word Saniku. The name “Saniku” (三育), is a combination of 三 (san, “three”) and 育 (iku, “to nourish, to bring up”), means “to make people whole” in physical, intellectual, and spiritual attributes. To Sabbath School teachers: This story is for Sabbath, July 28. Iku loved her new Bible. She opened it and read it. Some words were difficult to understand, but she was so happy to have her own Bible! She kept reading the Bible as she got older. Then one day when she was in the fifth grade, she thought to herself, “Why can’t I read the whole Bible?” She couldn’t think of a reason why not, so she decided to read the Bible from the beginning to the end in one year. But Iku had to figure out how to get through the entire Bible in a year. First, she counted how many chapters are in the Bible. [Ask the children how many chapters are in the Bible.] Iku learned that the Bible has 1,189 chapters. She could finish the Bible in one year if she read three chapters every day and five chapters on Sabbaths. Iku wondered when she would find the time to read the Bible. She had lots of homework in the fifth grade, and she didn’t have much time after school. Her mother said it would be better to read the Bible in the morning, before school, so she could start the day with Jesus. So, Iku set her alarm clock for 5 o’clock. Iku found it difficult to wake up so early. Everyone was still sleeping, and it was dark outside. But she remembered that she wanted to read the Bible in one year, and she jumped out of bed. Then she started with the first book of the Bible. [Ask children if they know the first book of the Bible.] That’s right, the first book is Genesis. Iku found that it takes only 30 minutes to read five chapters every morning. Before she knew it, she had read the whole Bible in a year! Then Iku thought, “That was so interesting! I want to read the Bible again!” So, when she started sixth grade, she read the whole Bible again in a year! Something interesting happened as Iku read the Bible. She began to change. She started to want to memorize the Bible—not just the Sabbath School memory verse but other parts of the Bible as well. She also became happier and smiled more. People liked being around her. 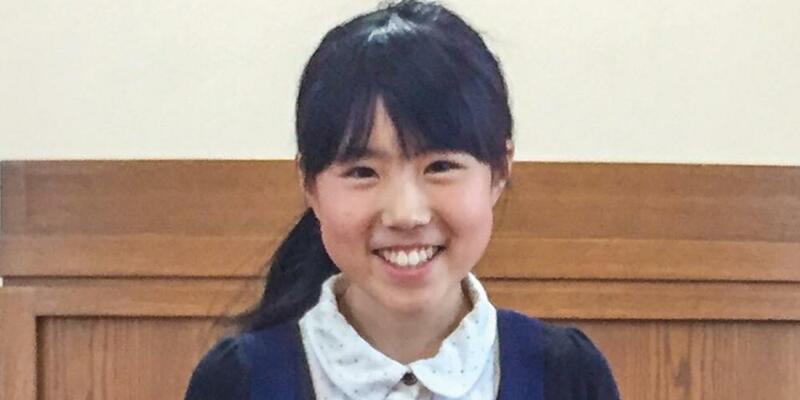 Iku’s big sister, Nana, who is 14 years old, said Iku now understands the Sabbath sermons better than anybody in the family. Iku’s little sister, Miko, who is nine, wanted to be like Iku and began to read the Bible, too. Iku’s favorite book of the Bible is Romans. “There’s a lot of good verses there,” she said. Her favorite verse is Romans 8:38, 39, which says, “For I am persuaded that neither death nor life, nor angels nor principalities nor powers, nor things present nor things to come, nor height nor depth, nor any other created thing, shall be able to separate us from the love of God which is in Christ Jesus our Lord” (NKJV). Iku said it’s not difficult to read the whole Bible. The secret is to read a little every day. “Even just little by little, read the Bible every day,” she said. For medium-resolution photos for this and other mission stories, visit the Facebook page for Mission quarterlies. New photos for the weekly story are posted the Sunday before they are to be presented in Sabbath School.